Saturday March 14, 2015 — State College has a lot to offer to sports nuts. Happy Valley has one of the biggest football stadiums in America, shiny new Pegula Ice Arena for hockey, historic Rec Hall and the multi-purposeful Bryce Jordan Center. But halfway around the world in the middle of the bustling city of Hong Kong sits another Happy Valley, and at the center is the Happy Valley Racecourse. This place offered something I have never experienced before in sports. Celebrating its 130th anniversary, the Hong Kong Jockey Club has hosted horse racing in the city since 1884. It remains one of the most popular sports in Hong Kong. Each week Happy Wednesdays are hosted at Happy Valley as a way for all types of people to take a break from the work week and have fun. There are no large hats and bright, pastel colors donned by less-than-casual onlookers like one would see at the Kentucky Derby. But there are some unique sights at the races. In the public area at track level, it is an atmosphere similar to a baseball game in the United States. People of all ages sit in stands, souvenir shop and indulge in local food. Further above the track and safe inside from a misty evening, there is a wide array of options for members of the Hong Kong Jockey Club. A night at the races can range from sitting in a quiet private box, to watching the races on iPads while having an upscale dinner, to a nightclub geared specifically toward the younger crowd. Each time I walked through a new door during my tour of the facility, I felt like I needed a new outfit. Had I not been dressed to sit in a steward’s box like I was, workers probably wouldn’t hesitate to remind me that there is an official dress code for the races. At the most elite parts of the facility, you have to be dressed in suit and tie, with ladies dressing accordingly. Despite the different outfits, there is one common theme no matter which part of Happy Valley I was in: people were focused on betting. Whether it is HK$10 (about $1.30 in the U.S.) or HK$5,000 (about $640), betting is the most central part of the experience. As soon as the bells ring for a race to start, everyone’s attention shifts. With nine races scheduled 30 minutes apart from the last, a night at Happy Valley translates into more than four hours of screaming as the horses sprint by. This is what makes the experience so incredible. While horseracing is becoming outdated in most parts of the world, the Hong Kong Jockey Club invests in yearly renovations of Happy Valley and Sha Tin, its other race course, to keep up with the demand of the sport. Being a member of the Hong Kong Jockey Club is still a statement of status, as many people told me, but horseracing is the only sport offered to the people of Hong Kong other than soccer. I’ve been to the quadruple overtime game at Beaver Stadium when Penn State beat Michigan in 2013. I witnessed the upset at Pegula when Guy Gadowsky’s young program beat Minnesota for the first time in February. My experience at Hong Kong's horse races seems to fit in with those unforgettable games at Penn State. It must be something about being in a Happy Valley. Saturday March 14, 2015 — Walk inside the headquarters of the Hong Kong Federation of Students and it’s hard to tell if you’re inside an office or someone’s apartment. There are boxes of trinkets everywhere, newspapers, photographs and postcards attached to the walls and filing cabinets overflowing with paper. There is so much lying around, it’s easy to overlook the young man curled up in a sleeping bag on the floor. Nowadays, there’s not too much activity going on at HKFS. However, that wasn’t the case a couple of months ago, when the office was a central meeting place for student leaders of Hong Kong's pro-democracy Umbrella Revolution. “Almost every day, afternoon or night people were meeting here to discuss what was the current situation,” said Alex Chow, a top leader of the movement. For Chow, the office is literally his second home. While the 24-year-old University of Hong Kong student has an apartment, he says that he sleeps at HKFS most nights and spends about half of every day there. While he may not have as much company at headquarters as he once did, Chow said he doesn’t plan on moving the federation’s base anytime soon. Saturday March 14, 2015 — Small homes and changing family structures may be contributing to high rates of elderly suicide in Hong Kong, where more than seven million people are tightly packed into a small area. Higher suicide rates among the elderly are an issue in many Asian societies, not just Hong Kong, said Edward Wong, fundraising and communications manager for the Samaritans, a non-profit, non-religious organization that provides confidential emotional support to people who are suicidal or are in general distress. But elderly suicide in Hong Kong may be a cultural issue, Wong said, because of changing family structures in the Special Administrative Region as well as very small living spaces. Frances Yik-wa Law, an assistant professor at the University of Hong Kong, views elder suicide as a global problem. Law said research hasn’t definitively linked changing family structures and cramped living conditions to elder suicide. But while not a definite cause, she said it’s one that shouldn’t be ruled out. Wong said the elderly are particularly at risk because of factors such as long-term illnesses, or because they no longer work and feel like a burden because their families may be supporting them. Taking their own lives seems like a way to relieve this burden, he said. He said Asian culture discourages people from talking about feeling unhappy. Condensed living conditions and high demand for living space is a particular problem for the elderly, he said. Wong said he doesn’t think the government is doing enough to fix this problem, so other organizations, like The Samaritans, have to pick up the slack. The organization has both phone and email hotlines, he said, which allow people to open up and express what they’re feeling. The Samaritans provide lectures for seniors to discuss the warning signs of suicide among the elderly. The organization hopes this will encourage older people to talk more openly. Friday March 13, 2015 — Five international reporting students from Penn State traveled north from Hong Kong into mainland China this week to visit one of the fastest growing cities in the world. Shenzhen was a sleepy farming village with a population of 30,000 in 1979 when it was selected to be one of five special economic zones by the Chinese government. It is now a technology innovation hub for the country, headquarters for Internet provider Tencent, and home to more than 15 million people. Friday March 13, 2015 — If you’ve been to Canal Street in New York or a similar outdoorsy market, you will recognize the scene at Hong Kong's Ladies’ Market (not just for ladies, despite the name) or Temple Street Night Market. They are fun during the day and even more vibrant when the stores and restaurants surrounding the markets light up the night. Hong Kong's outdoor markets certainly provide places to find the perfect souvenir. I seemed to be irresistably drawn to the bracelets, but there were also antique tea sets, leather-bound journals, paper fans, ornaments with colorful beads and tabletops featuring displays of jade trinkets and Buddha figurines. Shoppers can find tackier touristy souvenirs such as Hong Kong bottle openers and magnets showing the city skyline, as well. People speaking a variety of languages push their way through the bustling walkways between the tents. But souvenirs aren't the only attraction. There's food, especially at the Temple Street Night Market, where a tired shopper can buy a late night peanut butter waffle or other snack to finish out the night. Friday March 13, 2015 — Hong Kong has a lot to offer 24 Penn State students, ranging from an endless supply of traditional and new-age Chinese culture, to enough food options to make even the pickiest eater drool. Hong Kongers pride in their city is easy to justify. But perhaps the most surprising and satisfying find is the transportation system. The Mass Transit Railway system (MTR), opened in 1979 and includes subways, light rail and buses. MTR riders make more than five million trips a week. The system runs on time and its easy to pay using an Octopus card, which is a rechargeable card (like Lion Cash) that can be swiped to get on a train and also works as a cash card in many stores. For a directionally challenged person like me, trying to figure out a subway system is like putting together a Rubik’s cube blindfolded –- it just doesn’t happen. But for the first time in my 21 years, I found that I could find my route with ease. The signs in the stations are in both English and Chinese, and are clearly labeled and color-coded. Many subway cars have electronic maps to let riders know which direction the train is headed, what stop is next and whether it connects to another line. Exits are marked with street names and local landmarks so travelers can decide which exit is best. For the tech-savvy, there is an app that allows you to plan your route and provides specific directions to the destination. And, as if all of this wasn’t enough to make your inner subway snob swoon, I have yet to board a train or enter a station that wasn’t clean and orderly. As a New Yorker, I am impressed. Friday March 13, 2015 — In a small village near the border between Hong Kong and Shenzhen, China, two small restaurants greet visitors at a bus stop. Lining the walls of each restaurant are pictures marking generations of families who chose to live away from the hustle and bustle of Hong Kong Island. The restaurants serve traditional dishes, such as rice and noodles, but visitors can also enjoy something that goes back before 1997, when the British turned over Hong Kong to the Chinese -— a full English breakfast. Eggs, bacon, beans, toast, jam and, of course, English breakfast tea reflect a small part of the British influence left after decolonization. I was surprised to see British influence in a remote area outside of the city. Traveling around Hong Kong the British influence constantly pops into view. The MTR commuter rail system has a colorful, organized map, similar to the underground system in London, England. An English speaking announcer on the trains even says "mind the gap" to remind passengers to step all the way onto the platform when they disembark. The recording features an announcer with a classic British accent, similar to what Londoners hear during their daily commute on the tube, followed by the same voice in Cantonese, to remind us where we really are. The mark left behind by the British in the city goes beyond jam and public transportation. High tea is a popular tradition at the tea shops and cafes lining the streets of shopping plazas. The first day of our trip, I was wandering around the streets surrounding our lodging at Honk Kong Baptist University’s campus, and something sounded familiar to me -- the name "Waterloo." For anyone who has visited London before, Waterloo is a historic neighborhood in the center of the city. Other street names, like Aberdeen, Gloucester and Oxford, are also the same as in London. And there’s Victoria’s Peak overlooking the city, named after the queen. The cities of London and Hong Kong mirror themselves in a lot of ways, making it a familiar place to the British people who still live or work here, and to visitors familiar with Great Britain. Friday March 13, 2015 — Earlier this week a few of us visited Sui Wo Court, which is one of the public housing complexes in Kowloon. Dr. Bu Zhong, a Penn State professor who is traveling with us, lived in an apartment complex near the public housing when he was teaching at Hong Kong Baptist University. So he was familiar with the area and took us there for story research. The first thing I was struck by was the number of apartment buildings that we passed on our way there. It seemed like there was an apartment complex of some sort everywhere I looked. It is hard to imagine the sheer number of people who live in Kowloon and Hong Kong. The second thing that struck me was how massive the buildings were, yet how small the apartments seemed. Once we pulled up to Sui Wo Court, it was obvious that these apartments were, in fact, tiny by U.S. standards. Walking around the complex made me realize how fortunate I am and how much I take for granted. My apartment in State College would be a mansion for some of the people in Hong Kong, especially those living in public housing. But the third thing that struck me was how happy all of the residents seemed. Even though they lived in incredibly crammed apartments, none of them seemed upset by it. Children were playing, nannies were socializing, and adults were reading the local newspaper. To them, this was normal; this was their everyday life. Thursday March 12, 2015 — Students in the City University of Hong Kong's Interactive and Urban Media program produce a light and music show that plays across the 118-story International Commerce Center in Kowloon, which is the tallest structure in Hong Kong. Here is a six minute sample of the program, sped up to play in 17 seconds. Wednesday March 11, 2010 — I have a confession to make. Prior to this trip, my broadcast skills were pretty limited. I had never touched a tripod, attached a lavaliere microphone to anyone or even brought something into focus on camera. Sure, I’ve filmed stuff with GoPros and used iMovie, but that’s about it. After all, one of the perks of being a writer is that you don’t need much equipment to do your job. Still, I couldn’t help but feel excited on Wednesday when classmate Megan Flood asked me to accompany her while she shot footage at a BMX park. Not only did it sound like a fascinating story, but it also gave me a chance to see a side of journalism that I knew little about. Thankfully, Megan actually let me be a part of the process instead of just making me to stand around while she conducted interviews with a young bike rider and her mother and coach. Apart from helping film, I also got to ask each person some questions. I’m not gonna lie, it wasn’t long before I showed how inexperienced I was. It took me a couple of tries to set up the tripod right and trying to get Megan into focus was another ordeal entirely. That being said, it was an excellent learning experience that taught me just how hard it is to get a broadcast piece right. Every word has to be spoken clearly, each angle needs to be shot just right and the backdrop and lighting of an interview always needs to be taken into account. As someone who is accustomed to working by just turning on a recorder and firing away with questions, I was impressed by how much detail Megan put into each aspect of the project. Broadcasters may make their stories look effortless, but that is certainly not the case. Maybe one day I’ll venture into more camerawork, but for now, I think I’ll stick with my recorder and notepad and let the TV experts take care of the rest. Wednesday March 11, 2010 — The Mong Kok neighborhood in the Kowloon area of Hong Kong is known for its street food and ladies’ market – a street lined with vendors selling souvenirs and knock-off items. During the morning, Mong Kok is relatively serene – pleasant smells drift from nearby teashops and noodle houses, locals sit outside reading the morning paper while sipping hot milk tea and nibbling on a traditional breakfast like seafood congee and steamed lettuce with oyster sauce. Everyone is relaxed and getting ready for the day. The late morning sun shines on a street filled with rows of tents as one vendor in the ladies’ market hangs up “Lost in Hong Kong” T-shirts and Bart Simpson USB drives, while another uncovers fresh fruit at an open air stand. At night Mong Kok becomes a sea of energy. Fluorescent and full of life, people crowd the ladies’ market haggling for trinkets. A vendor shows a customer HK$150 on her calculator, but the customer hopes to pay on HK$70 for that happy Buddha figurine. As the transaction nears a close, people bustle and bump past in the narrow lane beneath brightly colored signs hanging from the tall buildings above. The final price is HK$100, which is about $13 in the U.S.
Hidden nearby on side streets behind the vendors is a wide variety of street food – everything from chicken feet to squid tentacles on a stick. One of the most popular local delicacies is something called “fish eggs,” actually small dumplings of fish meat wrapped in dough and boiled in a spicy yellow curry sauce. Some vendors delicately slide 7 or 8 fish eggs onto a stick, others hastily spoon 2 dozen of them into a disposable bowl, then wait for the next customer to step up for a tasty sample of Mong Kok street fare. Wednesday March 11, 2010 — Before coming to Hong Kong I remember imagining a city with an impressive skyline, bustling financial districts and luxurious cars. Being here for as little as three days has broadened my perspective. I discovered sprawling university campuses, busy neighborhood markets and enormous malls, coupled together by high-speed metro trains. While the concrete infrastructure of Hong Kong is impressive, its people give the city meaning and character. This gallery includes images from the marketplace in Sheung Shui and a mall in Kowloon. A group of men react during a game known as 'Xiangqi' in a park in Sheung Shui, a town on the Northern border between Hong Kong and China. A Coca-Cola employee opens his company truck's storage to transfer supplies to a local shop in Sheung Shui, a town on the Northern border between Hong Kong and China. Shoppers at the Festival Walk mall in Kowloon Tong, Hong Kong. Passengers on Hong Kong's MTR metro train. Tuesday March 10, 2010 — It’s usually easier to go with a known, constant option. But sometimes the mystery and intrigue can be much more fulfilling. Yesterday, when accompanying a classmate to an interview in Sheung Wan, Hong Kong, I found myself with about an hour and change of downtime, nearly dead laptop and cell phone batteries, and a whole lot of work that wasn’t going to get itself done. I looked around for a place to settle down and, if I was lucky, find some wi-fi and juice for my batteries so I could hammer the work out. Walking down Queen’s Road Central, I saw two choices: there was a Starbucks down the road — a solid, if unspectacular option — and a completely unknown quantity, called Cafe O. For no other reason other than impulse, I threw my bag over my shoulder and ventured in. I was impressed as soon as I walked through the door. My ears heard not the Cantopop style music that I had been hearing for our first few days in town, but instead some American classic pop music. I ordered a coffee at the counter for $34 HK (about $4.38 $US), and saw stairs leading to an upper level portion of the coffee shop. I got upstairs and pounced at a seat in front of a window, with two charging outlets. I put my number down and was almost immediately greeted by an English-speaking worker, who gave me the coffee I ordered and went out of his way to help me set up a wi-fi connection — a far cry from some of the Internet issues I would have at a Central Starbucks later in the afternoon. My hour in that coffee shop flew by. It was a delicious cup of coffee and the second-floor view of Hong Kong wasn’t half-bad either. My batteries got the charges they so desperately needed, I got all my emails sent and work done while listening to some classic American music (“Come on Eileen,” and “Don’t Stop Believin’” were part of the soundtrack). I learned that in Hong Kong, it can’t hurt to try something new and listen to something old. Tuesday March 10, 2010 — John Stuetz is working on a story about the pro-democracy movement in Hong Kong, where voter rights are being eroded by the mainland Chinese goverment. Monday March 9, 2015 — Nathan Law paused before taking his next bite of fried pork in Lingnan University's upper canteen dining area. Law's face has become familiar to millions of viewers around the world who have followed Hong Kong's pro-democracy Umbrella Revolution. Today, he's just another 21-year old eating dinner. After serving as an active leader of the Hong Kong Federation of Students during the protests, the transition back to everyday student life has taken time. "To be honest, at the very beginning, I was not very comfortable or familiar with [college] life. Because the occupation lasted for three months," said Law, a social sciences major. "It's just like drastic change. But after a short period of time, I began getting used to it. Before you knew it, I was like an ordinary student." Law has enjoyed a break from the spotlight. "I play computer games. I play football, and I watch football. I play FIFA," Law said. "I play League of Legends, and I watch a lot of Premier League games." Nathan Law, one of the student leaders in the recent Umbrella Revolution, during an interview with Penn State student John Stuetz in Lingnan University's canteen. Just a few months ago, Law's days were far less ordinary. Starting September 28, thousands of Hong Kong citizens followed the lead of pro-democracy student organization figureheads, such as Law and Joshua Wang, who began setting up continuous protests in main city streets. When Hong Kong became a special administrative region of China in 1997, after being handed over by Britain, its citizens were promised an opportunity for true democracy. Hong Kongers are free to elect any candidates on the ballot, but those names are controlled by mainland China. Annual protests for universal suffrage grew into massive and prolonged demonstrations in 2014. The Occupy Central movement pushed back against Beijing's emphasis on the "one country" aspect of the parties' "one country, two systems" agreement. The pro-democracy movement was successfully ordered to clear the streets in December, allowing Law and other students to return to school. But Law's days as a typical college student may be numbered. He predicts further protests could resume following government ruling on the 2017 Chief Executive election voting details. "America definitely has two parties that dominate the political scene. You guys are not very hopeless in the political environment. But we need that," Law said. "The influence of the political parties in Hong Kong are very weak. That's why the students have to be the center of the spotlight for the movement. But you have to work hard at what you believe for very long, to get what you believe in." Law has been summoned by the police to explain his role in the protests and said it's "inevitable" he will be charged in the coming months. In addition, he said he will face limited employment opportunities, because he's been banned from entering the mainland. "It's worth it," Law said. "At least I think." Monday March 9, 2015 — Having come to Hong Kong planning to write about the Umbrella Revolution, I was thrilled to have the chance to sit down today with Cleo Tse, an active participant in the movement and a former student of Dr. Bu Zhong, one of the Penn State journalism professors who helped organize this trip. After getting in touch with her minutes after getting off the plane on Sunday, Cleo suggested we chat at a Starbucks. Though I initially planned to avoid going to American eateries while in Hong Kong, dining on a lunch of chicken feet (sort of like chicken wings but chewier) softened my stance on the matter. Prior to our conversation, I didn’t know much about Cleo’s specific role or thoughts on the student protests against Hong Kong’s eroding democracy. As it turned out, she was not only highly supportive of it, but also very involved. Despite having just started a full-time gig as a marketing executive for an art company, she still spent nearly every weekend this fall at the protest site. I left the interview with a better understanding of the democracy movement. Overall, my conversation with her was the highlight of my first day, more so than those chicken feet were. Monday March 9 — While dining in the canteen of City University of Hong Kong, classmate Katie McKenna and I were approached by a student to participate in her psychology study. Karen Yau, a student at Shun Yan University in Hong Kong, was doing a study on listening skills related to each ear. However, the catch was that the participant had to be a native English speaker, which Katie and I are. After spending four hours and asking all the questions are at Hong Kong Sze Yap Commercial & Industrial Association Wong Tai Shan Memorial College, it was nice to have the roles reversed and to have to answer some questions. It didn’t take more than five minutes to complete the study. First, we filled out a form about which hand is dominant in 10 categories. For the second portion, we listened to four voice tracks, two in English - one on the left and the other on the right - and two in Cantonese - same with one on the left ear and one of the right - and were asked to repeat each word as we heard it. As it turns out, Katie has a more drastic difference in hearing between her two ears than I do. However, helping Karen out taught us more than just the difference in our hearing. We weren’t strangers to asking directions or asking for wifi passwords all day, but to have someone come up to us for a change was a nice change of pace. Helping a fellow student do her study was as much fun as doing our interviews all day. Monday March 9, 2015 — As the sun began settling low on the horizon, a fishing boat pulled into a transfer dock off Lamma Island, west of Hong Kong. It was the end of a long day of fishing, but the catch -- all still alive -- had to be moved from the boat into netted holding areas. Lamma Island, also known as Pok Liu Chau, is the third largest island in Hong Kong and it has Hong Kong's largest fishing farming zones at Sok Kwu Wan. 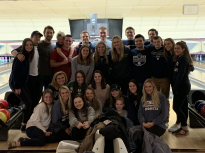 Saturday March 7 and Sunday March 8, 2015 — Penn State’s International Reporting Class (Comm 402) began their journey by bus, at 8:30 a.m. yesterday morning from State College to Newark Airport. Students and faculty gather for a group photo before boarding the bus at Rec Hall. To get students ready and excited to travel to Hong Kong, Professor Katie O’Toole divided the bus in half and quizzed the class in a Jeopardy-style game. Jerry, our bus driver, proved to know quite a lot about Hong Kong and unexpectedly led the left side of the bus to a win! The flight from Newark to Hong Kong was delayed by an hour, but students and professors made the best of the time by grabbing a bite to eat and sharpening their skills on camera equipment. The plane landed around 8:52 p.m. Hong Kong time, 12 hours ahead of East Coast time. The airport was filled with fashion and electronic ads both in Chinese and English, which started to give students a feel for Hong Kong. It took 16 hours to fly from Newark, NJ, to Hong Kong following a route north through Canada, over the Arctic Circle then south through Russia and China to Hong Kong, which is on China's south coast. The bus ride from the airport to the NTT International house gave everyone a glimpse of the skyscraper-speckled skyline Comm 402 would explore tomorrow. Students will be Tweeting, Facebook-ing, and Instagram-ing photos and experiences during the trip. You can find these by searching the hashtag #PSUinHK on social media. Shannon Gethard is a recent graduate of the Pennsylvania State University where she earned her Bachelor of the Arts degree in Broadcast Journalism. During her time at Penn State, Shannon served as news director for ComRadio News, president of the PSU chapter of the Society of Professional Journalists, and acted as both an anchor and reporter for the Centre County Report. She also hosted “The Morning Drive with Shannon” on Eagle 98.7/WEMR-FM and was a producer for “The Morning Zoo” on B94.5/WHBV-FM. Akash is a documentary photographer from India interested in exploring issues facing the younger generation of immigrants and political refugees. Annemarie Butkiewicz is a senior pursuing a degree in journalism, and French and Francophone studies. After graduation, she intends to continue telling stories through print and multimedia platforms. Emily Chappell is looking forward to covering local news as a reporter after graduation. Emily worked for The Daily Collegian for three years, covering performing arts, crime and most recently working as the Opinions Editor. Shannon Sweeney is the editor in chief of Penn State’s student newspaper, The Daily Collegian. She has interned at The Global Legal Post in London, UK and at her hometown paper, The Pittsburgh Post-Gazette. She is interested in copy editing and political reporting for a print or online publication after graduation. Matt has completed internships at GoPSUsports.com, StateCollege.com and Comcast SportsNet Philadelphia during his time at Penn State. He will be starting his journalism career after graduation at the York Daily Record. Evan is a print and digital journalist who worked at The Daily Collegian most recently as Features Editor. He grew up just outside of New York City in Upper Saddle River, New Jersey. Kristen is from Canton, Ohio and is the football editor for The Daily Collegian. She will be interning for NHL.com in New York this summer. John Stuetz was a reporter and columnist for The Daily Collegian before graduating in May 2015.